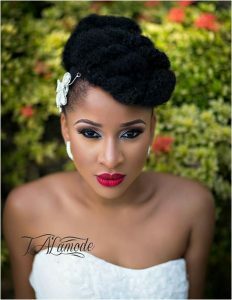 This is the Biography and Net Worth of Tolulope Adesua Etomi, fiancée of the singer-songwriter, Banky W. Adesua Etomi was born on February 22, 1986 in Owerri, Imo State, Nigeria. Her father is a soldier and her mother is a civil engineer. Adesua Etomi is the youngest of 3 children. Adesua is the inter-tribal product of an Esan father from Edo state and a Yoruba mother. Adesua Etomi is a Nigerian actress and in 2014, she starred in her first feature film, Knocking On Heaven’s Door. She won the Best actress in a drama award at the 2016 Africa Magic Viewers Choice Awards for her role in another film, Falling. Adesua’s first encounter with acting was at age 7, when she joined the drama club at her primary school, Corona School, Victoria Island, Lagos. At age of 13, Adesua Etomi moved to the United Kingdom and after a few years, decided to pursue acting as a career in 2004. While in the United Kingdom, Adesua studied Physical theatre, Musical theatre and Performing Arts at the City College, Coventry, United Kingdom. After completing these courses in 2006 with triple distinctions and being a part of numerous productions, she went on to study Drama and Performance at the University of Wolverhampton where she excelled greatly, graduating in 2009 with 1st class honors and ‘The Foursight Theatre Award’. Adesua Etomi moved back to Nigeria in 2012 and resumed her acting career in 2013. Although most of her training lies in theatre, she is best known for her roles in the movie ‘Knocking on heavens door’, the shortfilm ‘Brave’ and the groundbreaking tv series ‘Gidi up’. She has also been part of numerous theatre productions and musicals; Saro, Les Miserables, London Life Lagos Living, The Secret Lives of Baba Segi’s wives, Shattered and Crystal slipper among others. On February 2017, Adesua Etomi got engaged to singer-songwriter, Banky W.
No doubt the Nigeria singer – song writer BANKY W got engaged to a good woman. A woman of virtue, that kind of woman who stands with her man in good and bad times. Adesua Etomi, my role model, May God bless your union with Banky.! she is a good entrepreneur,and a good actress she find are way into limelight in the movie THE WEDDING PARTY.and nw engaged 2 banky w.
Adesua etomi is a talented woman,a woman with brains,am proud of her achievements and her marriage with bankole willingthon aka banky w.
She has achieved so many things in life sometimes I just want to be like her but I have passion for my course, I like it that it is a woman that is achieving all this she has gone far thank God for her life let her marry good that will take of her. Such a good and encouraging biography looking up to you as one of my role model. Adesua Etomi is like a role model to me .her getting married to Banky W is one of the best thing that can happen to her .Adesua Etomi’s movies are heart waning and passionate to all although that sometimes she makes mistake in the first instance in chosing the right patner but corrects herself at last like in her movie (knocking @ heaven’s gate).Ride on ma.The lord bless ur union . This is really a tale of life,from Grass to Grace these is really every woman desire to be married some day.reg no 2016054083/quiz no 15,group no 15s. This is a very talented actress ,she has done excellently in her career which has earned her great awards and a great person like herself for a husband .She has deplayed her God given talent for the entertainment of her audience and therefor deserves the awards that she currently has. She is a beautiful, homely and wonderful talented actress. she knows her work and kills it more when its an emotional role. her getting married to Banky W is amazing and I wish her a happy marriage life. I love u sweetie..